Budget carrier Vietjet and France’s Airbus signed a purchase agreement for additional 50 A321neo aircraft worth 6.5 billion USD according to the manufacturer’s list price in Hanoi on November 2. The agreement is a step further from the Memorandum of Understanding (MoU) signed by the two sides in Farnborough, the UK, previously. Vietjet President and CEO Nguyen Thi Phuong Thao and Airbus Chief Commercial Officer Christian Scherer represented both parties to sign the contract. Scherer said the airline’s latest preference for the Airbus product is a testimony to a great endorsement for the A321 in the fast-growing market. The new order is to realise Vietjet’s growth strategy and enhance the airline’s operation efficiency and capacity to expand its flight network, especially on international routes, and serve its development of airline alliance across the Asia-Pacific region, which sees the fastest aviation growth rate in the world. As part of this agreement, Airbus also deploys a series of strategic partnership programmes, including training for pilots, technicians and engineers; flight management and safety management for Vietjet. 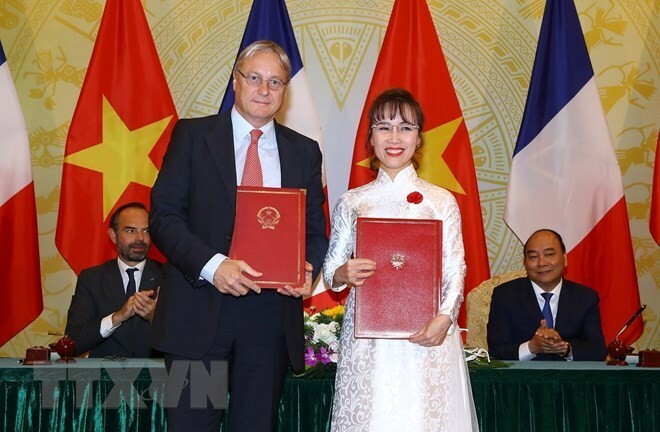 The same day in Hanoi, Vietjet CEO Thao and Vice President of Sales and Marketing for CFM International Philippe Couteaux signed a MoU for a long-term LEAP-1B engine support worth 5.3 billion USD according to the manufacturer’s list price. The MoU includes spare engines and support packages to serve the airline’s already-ordered new and modern aircraft. CFM International has provided engines for Vietjet’s modern aircraft since the airline commenced operations in late 2011 with CFM56-powered aircraft and currently operates a fleet of 65 CFM56-powered aircraft. “The LEAP-1B has been doing extremely well in commercial service in the last 18 months and we believe the engine will prove to be an important asset for VietJet over the long term,” Couteaux said. Over the past seven years, CFM has worked closely with VietJet to introduce several support programmes in terms of technical management, training, and fuel efficiency.